The United States continues to be a highly religious nation. Most Americans say they belong to a particular faith and large percentages agree with statements about key religious beliefs and behaviors. About three-quarters of the public (76%) say prayer is an important part of their daily life, while an identical percentage agrees that “we will all be called before God at the Judgment Day to answer for our sins.” And eight-in-ten say they never doubt the existence of God. The percentage of the public agreeing with all three statements has shifted little since the first Pew Research values survey in 1987. That year, 68% of respondents agreed with all three statements; this year 67% do so. There have been smaller declines in the percentages of Millennials agreeing to the other two statements about core religious beliefs – the personal importance of prayer and belief in a Judgment Day. Still, just 55% of Millennials agree with all three religious values; among older age cohorts, two-thirds or more agree with all three religion statements. 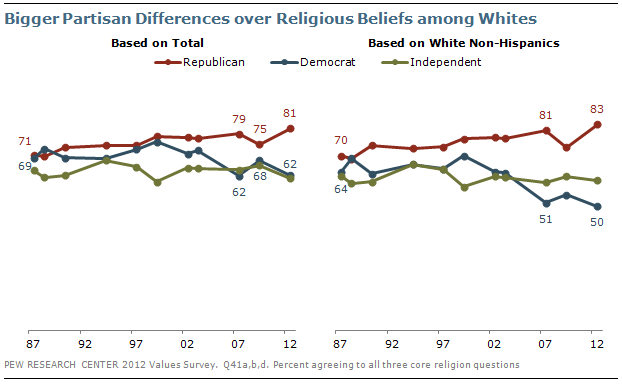 The partisan gap over the three religious values questions, while substantial, has not increased much in recent years. Currently, 81% of Republicans agree with all three religious values statements, compared with 62% of Democrats and 61% of independents. In the 2007 study, there was a similar gap. In the first political values survey in 1987, however, there were only modest differences in the percentages of Republicans (71%), Democrats (69%) and independents (64%) who agreed with all of these statements. Just half (50%) of white non-Hispanic Democrats agree that prayer is personally very important, never doubt God’s existence and express belief in a Judgment Day. That compares with 60% of white independents and 83% of white Republicans. There are widening ideological differences among Democrats over the statement “I never doubt the existence of God.” The percentage of liberal Democrats who agree with that statement has fallen by 13 points since 2007, from 73% to 60%. 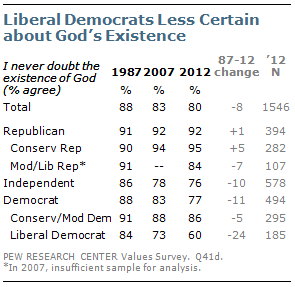 In the first political values survey, 84% of liberal Democrats said they never doubted God’s existence. By contrast, conservative and moderate Democrats continue to overwhelmingly say they never doubt God’s existence (91% in 1987, 86% today). 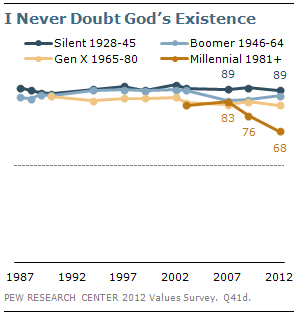 Among white conservative and moderate Democrats, 82% agree that they never doubt God’s existence; 17% disagree. Among white liberal Democrats, about as many agree (49%) as disagree (48%). While the overall shifts in religious values have been modest, there has been a more clear downward trend over time in the level of conservative views on many social values. There have been declines in the overall percentages saying that school boards should be able to fire homosexual teachers, they have “old-fashioned” family values, women should return to their traditional roles and books with “dangerous ideas” should be banned from public school libraries. However, nearly as many say there are clear guidelines about good and evil as did so in the 1987 (76% today, 79% then). The average number of conservative responses on an index of five social values questions has dropped from 3.0 in 1987 to 2.3 this year. The index has ticked down in most of the values survey since 1999. As with religious values, Republicans are more likely than Democrats or independents to hold socially conservative views. On average, Republicans gave 2.7 conservative responses to the five questions on the index, the same as in 2009. 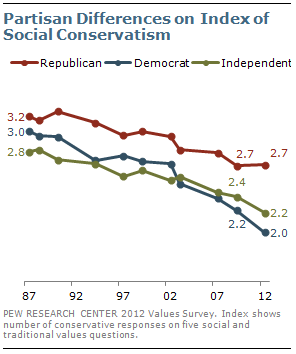 Still, that average number of conservative responses has dropped from 3.2 in 1987. Democrats, on average, gave 2.0 conservative responses, down slightly from 2.3 in 2007 and 3.0 in 1987. On average, independents give conservative responses to 2.2 questions, down from 2.4 in both 2007 and 2009. In 1987, independents gave conservative responses to 2.8 out of the five questions. Generational change is a factor in the decline in social conservatism. For example, the Baby Boomers offer fewer conservative responses than the Silent generation (2.3 vs. 2.7) and the youngest cohort, the Millennials (1.9), offer fewer than the Baby Boomers. The issue of whether school boards should be able to fire homosexual teachers was divisive in the early political values surveys. At that time 51% agreed that “school boards ought to have the right to fire teachers who are known homosexuals,” while 42% disagreed. But for more than 20 years, majorities have disagreed with this statement. In the last five years alone, the percentage saying school boards should not have the right to fire openly gay teachers has increased from 66% to 75%. In recent years, the public also has become much more supportive of rights of gays and lesbians to marry legally. There also has been change in opinions about “old-fashioned” family values. In the first political values survey, 87% agreed they have “old-fashioned values about family and marriage.” By 2007, 76% agreed with this statement and in the current survey 71% agree. There has been less change in opinions about whether “there are clear guidelines about what’s good and evil that apply to everyone regardless of their situation.” Nearly eight-in-ten (79%) agreed with this statement in 1987; 76% agree today. 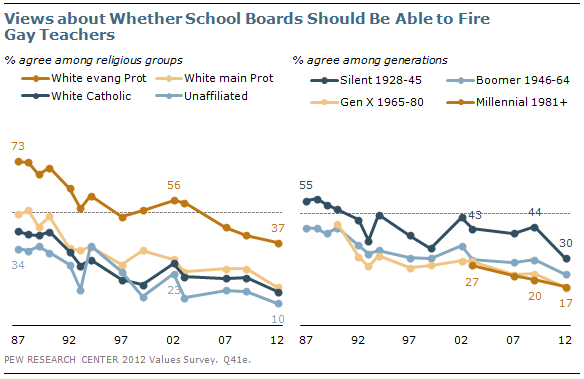 There have been major changes within age cohorts, including the Silent generation, in opinions about whether school boards should be able to fire openly gay teachers. In 1987, a 55% majority of Silents (born 1928-1945) said school boards should have the right to fire openly homosexual teachers. By 2007, just 44% agreed. Since 2007, there has been a further 14-point decline in agreement (to 30%). While white evangelical Protestants have long been more supportive of school boards’ right to fire homosexual teachers than have members of other religious groups, the percentage of white evangelicals agreeing has fallen by about half – from 73% to 37% – since the first political values survey. As recently as a decade ago, most white evangelicals agreed that school broads should have the right to fire openly homosexual teachers (56% in 2002). Since 1987, there have been declines in the percentages of independents and Democrats who say they have “old-fashioned” family values. But Republicans’ views are largely unchanged. Currently, 91% of conservative Republicans say they have old-fashioned family values, which is virtually unchanged from 25 years ago (93%). 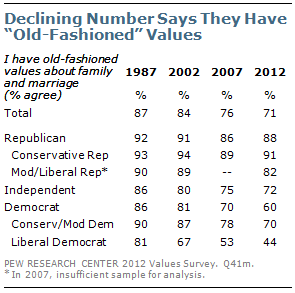 Among moderate and liberal Republicans agree, 82% say they have old-fashioned values. Conservative and moderate Democrats are far more likely than liberal Democrats to say they have old-fashioned family values (70% vs. 44%). But the share of both groups saying this has declined since 1987; at that time, 90% of conservative and moderate Democrats and 81% of liberals agreed they had old-fashioned values. For the first time, a majority (55%) disagrees with the statement: “Books that contain dangerous ideas should be banned from public school libraries.” Four-in-ten agree (40%). In 2009, the public was evenly divided: 49% disagreed and 46% agreed. In 2002, more agreed than disagreed that books with dangerous ideas should be banned from public school libraries (53% vs. 44%). Over the past decade, agreement with this statement has declined across political and demographic groups. Currently, 46% of Republicans say books with dangerous ideas should be banned, down from 54% in 2002. There also have been declines among Democrats (from 56% to 38%) and independents (47% to 36%). In 2007, 46% of Millennials agreed that books with dangerous ideas should not be permitted in school libraries, as did 54% in the Silent generation. 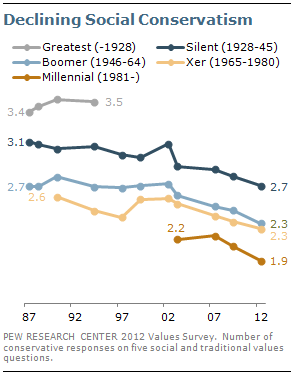 Since then, however, the percentage of Millennials expressing this view has fallen 18 points (to 28%), while Silents’ opinions have shown little change. As a result, the generational divide has increased considerably.